Listing all posts with label Family Portrait Photography. Show all posts. These guys contacted me to get some sibling photos taken for their Mum's birthday present. With one brother living overseas they took the chance to have these photos taken while he was home on holidays, as their Mum kept asking for photos of them together, so they arrange to have me take some professional portraits for them for her birthday. As you can see they have a great relationship and are close siblings, so we had lots of laughs and fun on a beautiful morning down at Chinaman's Beach Mosman. I always love working with families as it's so great to be able to capture these kind of connections. Every 6 to 12 months I get to catch up with Peter & Callum and have a family portrait session. We've been doing this since Callum was a baby and it's lots of fun. Each time I get to go on an adventure with these guys and capture what they are up to. Sometimes we have Onyx the family dog, a beautiful black labrador, and somethings we are being too adventurous for him. This session was held at Sydney Park in Alexandria, a great park which was redeveloped from an old brick works. It contains lots of open areas, wetlands with birds and streams and wooded areas. The other great thing about Sydney Park is its an off leash dog park so there are hundreds of people out walking their dogs. Peter has decided to start a new tradition where we are going to photograph Callum holding a framed photo from our last session so we can see how he's grown. This is the first one on these, and I look forward to seeing how the photos pan out over time. We photographed this couples wedding 5 years ago, so we were really pleased to hear from them recently to be asked to capture some family portraits for them of their family of four. We always love catching up with the couples we've photographed and seeing them interacting with their families. Dave and Sarah have recently moved into this beautiful home up in North Turramurra that has a fabulous back garden that backs onto the national park, and offers all sorts of adventures, so it was the perfect setting for their family portrait photographs. Thank you guys for inviting me into your home, it was lovely to see you again and meet the children! Our spring family portrait mini sessions were fabulous, the wisteria flowers were in bloom, the bees were buzzing, the sun was out! As you can see everyone enjoyed their 10 minutes playing in the wisteria grove at Muston Park Chatswood. Thanks to all the lovely families who joined me and have some lovely memories to keep. The gorgeous Stewart family are visting relatives in Sydney and thought they'd take the opportunity to have some family portrait photographs taken. It's such a lovely idea to have beautiful family photos to remember your holiday by. The location we chose was Blues Point Reserve because it affords fabulous views of both the Harbour Bridge and the Opera House, there was even a few ferries in the background to make the photos as icon Sydney as possible. They are such a loving family and the little interactions are beautiful to capture.....I hope you all enjoy the rest of your holiday! The day wasn't a disappointment, we had lots of fun with this family of 5, all three kids with different personalities and I hope I managed to capture this in my photography. Playing in the park and trees at Echo Point Park, Roseville and then down onto the beach.... my only problem there was trying to compete with the ducks for attention! Thank you Karine for contacting me! Autumn was so beautiful this year we held a couple of family portrait mini session days at Echo Point, Roseville Chase. The light and colours of autumn are just stunning and we had such fun with the families that booked in. I just love photographing little ones around this age, Balen is 13 months old and they are just so curious, but the best part about photographing babies and toddlers is capturing all the range of expressions they make as they practice communicating, it's just adorable and Balen was no expection. When photographing young children, if possible, I recommend we start at their home so they are in a comfortable environment, and then we can venture to a local area. This also give you a range of indoor photographs with flash lighting, and outdoor natural light images. This family are lucky enough to live near Ku-ring-gah National Park so after some fun at their lovely home we headed to the National Park which has lots of beautiful spaces. We've been friends with this family for a number of years now, we met them through Artarmon Community Church. They are such a lovely generous family and lots of fun. So when they contacted me about having some family portraits taken when both sides of the family grandparents could attend I was delighted, I knew it would be a lovely afternoon. We met at Tambourine Bay, in Riverview for some beautiful bush and harbour photos. All three generations of the family got into the swing of things and we had a bit of fun, you would never guess that the grandparents were in their 90's and 80s! Ahh Sydney's Northern Beaches really do spoil us with their natural beauty, there are so many fabulous locations for Family Portrait Photography sessions. The North Narrabeen Rockpools are perfect either early morning or late afternoon. On this occasion I met this little family early morning with the wave crashing and early morning swimmers we had a ball. Extended Family Portrait Photography Sydney in Family Home West Pymble 4 Generations Together - Large Family Craziness Captured! On arrival at this family home I was greeted by saying "Welcome to Chaos"..... as you'd expect with 4 generations of one family all together, and that's what I love about extended family portrait sessions. So I hope I have captured some of this craziness in my photography of this clan, I just love watching the interactions of everyone together and see the different personalities shining through..... it's this essence that I try capture and keep these memories for the families for years to come. Ryan arranged a family portrait photography gift voucher earlier this year for Rebecca as a present, and they chose the best time of year to use it. We arranged to meet early morning at Whale Beach, a spot they've always enjoyed coming to on the Northern Beaches of Sydney. It's just magical and especially first thing in the morning. I arrived a little earlier than them and thoroughly enjoyed my time just sitting and watching the waves, surfers, walkers and even a guy practicing his sand wedge shots up and down the beach! The Tan family were in Sydney for their youngest son's university gradulation, visiting from Malaysia so wanted to have memories of their visit to Sydney. And to take advantage of all being in the one city for a change. So we headed to Blues Point Reserve which has fabulous views of both Sydney Harbour Bridge and the Sydney Opera House. The morning was overcast and raining but Sydney still puts on a show and looks great in this weather. Thanks for visting Tan family, and having fun with me! It was time for my bi-annual activity with Peter & Callum, its been a little bit longer than normal between shoots so Callum has grown up a bit! Peter has asked us to photograph his adventures with his son every 6 months of so since his was a baby, it's a great way to capture his growing up and all the exciting things they get up to. Plus Peter is English so its lovely to have these photos to send home to his family. Unfortunately they've changed the rules about dogs being allowed on the beach at Chinaman's Beach, Mosman so their black lab Onyx couldn't come this time. Today's adventure was an afternoon at the beach, lots of fun chasing a beach ball in the wind, mucking around in the waves and then seaching for crabs on the rocks. Fi is one of my oldest friends, our mothers were friends before we were born so we have known each other all our lives. We have one of those friendships that picks up where is left off even if its been a year since we've seen each other, very special. So I was super excited last weekend to meet her whole extended family up at Pearl Beach on the Central Coast for an extended family portrait session. They were up there for a family holiday to celebrate some family milestone birthdays and thought it was a great opportunity to get some professional family photos of everyone in a great setting. Justin came too and we had so much fun, it helps that I've known them all my whole life, but even so they are a great laugh. The cheaky look on Terry (the grandfathers) face has always been there, he always looks like he's thinking something naughty and he's passed that gene down through the family! We first photographed Bride & Ant for their wedding 6 years ago, on a beautiful spring afternoon at North Narrabeen Beach (wedding was pre blog sorry!)..... we also photographed their first little boy with some baby portraits some 4 years ago. So when Bride called to say she wanted to give Ant an extended family portrait session for their 6th wedding anniversary I was so excited as we haven't seen them in an while! We decided to head back to North Narrabeen beach as its such a fantastic location in afternoon sunlight, and the shoot was booked almost to the same date and time as their wedding..... the weather and light were just as amazing! We had lots of fun with the boys, letting them be boys, and also with grandparents. Such fabulous memories to capture. Baby Ethan is just 4 weeks old, and he's been lucky enough to have his grandparents out visiting from the UK. So his parents thought is would be great to get some extended family portraits with both sets of grandparents, plus his parents and 2 year old sister Catelyn, before they headed home. So we met at Wendy Whiteley's Secret Garden in Lavender Bay, it's such a hidden gem of Sydney. Family Portrait Photography Sydney for Overseas Visitors at Blues Point Reserve - Visiting from Hong Kong - Lots of Jumping! Debby and Simon met in Sydney at university, and have lived in Hong Kong ever since. So they were out visiting family and friends in Sydney, with their children, and wanted to capture some family portraits to remember their visit. Debby also commented that most portrait studios in Hong Kong work indoors, so its great to get some family portraits taken on location.... and who could ask for a better location than Blues Point Reserve in North Sydney, with it's spectacular views of Sydney Harbour, on a beautiful Sydney winters day. I just love working in the Sydney winter light its so lovely and clear, and Centennial Park is such a great setting in beautiful sunshine or rain, so when Sumaira & Waqas chose the location for their family I was really pleased. This family portrait session was just perfect, the light, time of day, location, and last but not at all least this beautiful family. They had such a lovely approach to the day and were very excited and giggly throughout. The girls smiles are just infectious, and such gorgeous relaxed parents. It's she just adorable with those beautiful big blue eyes and the alabaster skin, little Emily at 3 months old. Emily's parents had seen my work at a friends place and contacted me when she was only a few weeks old to arrange a baby portrait photography session. As I always advise I suggested we wait until she was over 12 weeks old so that we can capture her personality in the photos. We booked in a date and the moved it as she was having physio on her neck, so we waited for her to get stronger and be a more relaxed baby...... and these are the results. This family contacted me with a last minute booking because their daughter was heading overseas for a year and they thought it would be good to get some family photos taken before she leaves. It's such a lovely idea for her to have memories of home. The lovely Jeanette's family arranged this extended family portrait session to coincide with their weekend of celebrations for her 80th birthday. Proud Grandparents always appreciate family photographs, and these photos will be especially treasured. The family including her two daughters, and three grand daughters had all travelled to Sydney for the weekend, with a special night out. So we met in The Rocks in the late afternoon for these portraits, before they all headed out to dinner. I really enjoyed my time with the whole family which was all laughs. Then two days later I received an email from one of Jeanette's daughters telling me that she had suffered a stroke on the Sunday and was paralised down her right side, so I sent over some photos of the whole family for her to have beside her bed in hospital. Life is strange with its twists and turns, and I'm sure this whole family appreciates this time they had together, and the photos which capture their memories, and this beautiful, bubbly lady, with the infectious smile. Isn't Ishara just the cutest little thing, I just love 6 months old, it's such an adorable age to photograph as they try to entertain you, and look curiously at everything you do. Ishara's parents were very lucky and a friend arranged a baby portrait gift voucher for them as a present when her Mum went on maternity leave. These gift vouchers can be used for portrait sessions with the baby anytime up until they are 1 year old. So I came to their family home and had some fun with them all, and really enjoyed editing the photos with those beautiful brown eyes! 1st Birthday Party & Naming Ceremony Event Photography Sydney - Family Home Mosman - Congratulations Nicholas! Nicholas' Mum is a very old friend of mine, so I was honoured when she asked me to photograph his Christening & 1st Birthday Party! The celebration was being held at the family home, so we arranged for me to arrive early to get a few family portraits before the guests started arriving, always a good idea. Nicholas is the smiliest 1 year old I know so he was easy, his big brother on the other hand was not so keen on the camera.... but very cheeky! And as you can see they are both besotted with their Grandma. Then the party began with lots of family and friends around to help celebrate, and a lovely naming ceremony carried out by one of our favourite celebrants Elaine Searle, held on the deck with the lovely afternoon sun in the background. Meet baby Isla just 5 days young! Isla's Mum was our eldest daughters class teacher last year, so I feel like I've watched Isla grow all her life! It was such a treat to finally meet her and be asked to "Capture the Memories" for her family of this precious time, when she is such a wee little thing. She was such a good girl too, lovely and relaxed. Last week I received a phone call from Kim calling from Auckland, she explained that she had just be diagnosed with terminal cancer and was flying over to Sydney that weekend to visit her adult children and wanted to capture their memories with a family portrait sessions. As is often the case Kim said she'd been meaning to organise some family portraits for a while and this had finally pushed her to get it organised. I was so touched, I juggled a few things around in my schedule to fit them in. I felt very proud that I could offer this for her family. They had a busy weekend planned with social gatherings and a helicopter flight over Sydney, so we slotted the session in for late afternoon on Saturday when the light would be at its best at Chinaman's Beach. It was lots of fun, even if the kids really didn't like having their photo taken! Last year I was asked to donate a family portrait mini session to the local school for inclusion in their silent auction at a fundraising event. I of course was more than happy to help out the local community. This family were the luck winners! We arrange to meet them at their family home, to capture their backyard where they play and also some of their family fun. With 3 girls, 2 of them twins, there was lots of laughs as you can see.... A family dancing session, and just completely crazy family photo! A family portrait mini session is 45 mins, and they receive 40 high res images in both colour and B&W! If your family is having their extended family Christmas lunch or celebrations not on Christmas Day it's a great opportunity to have some professional family portraits of the whole clan taken. Which is exactly what the Van Gool family arranged this Christmas. Four generations of this large family were all gathered for lunch in Dulwich Hill and I joined them after lunch where we walked to the local park for some fun. Capturing the extended family, and then each family group. It did create a few laughs, especially at those thinking back to the last time they had a photo as a whole family and what they all looked like! We just love it when one of the couples that we photograph contact us for some baby portraits. We photographed Mel & Matt's wedding 3 years ago, and now they have 2 little boys. Benji just 5 days old, and his big brother Ollie who is very proud but still not quite sure about loosing the attention. Peter has been asking us to photograph his family since Callum was 12 months old. We photograph them every 6 months with the family dog, when appropriate, to capture them for family back in England. It's such a fabulous way for them to "Capture their memories" and has now evolved into more of a docu style portrait session. We come along with Peter & Callum on an adventure and just capture the fun they have. This time it was a bush walk along Flat Rock Gully Track in Naremburn, where Peter runs regularly. We had a play in the playground first, then walked along the track down into the gully for a splash in the creek. Unfortunately the weather is something we can't plan (which you'll see from the previous shoot with puddles and rain) and it was 35 degrees and boiling but we soldiered on and the boys enjoyed putting their feet in the cool water and racing stick boats down the creek. We also saw some "tigers" in the forest and had fun with different games. To view Peter and Callums story see the below links. Katie is an old friend who we've photographed before, she called me because they have sold their family home which they have fully renovated and the boys have lived in since birth. As they were about to move she wanted to "Capture their Memories" of this home and all it has meant to the family. What a lovely idea! So we spent the morning photographing the family around the home, front and back gardens, playing their bedrooms, and in the park which is just out the back gate! Poor little Hugo had spent the week with gastro, and even the day before in hospital, however as there were about to move we couldn't change the date. He did remarkably well considering he had no energy but we did work hard to get his interest.... even putting him in Daddy's car :-) Isn't it lucky he has a great big brother who was looking out for him and making him laugh too. We love Centennial Park in the early morning, the light is just special and this morning with some fog and mist just clearing it was amazing. The Natawardaja siblings had arranged this extended family, or Multigeneration portrait session as an anniversary present for their parents. A chance to get the whole family together for some photos, along with the individual families and the grand children. Always a well received and treasured present idea! What a stunning September morning on Sydney Harbour. The school holidays, 30 degrees, just a few clouds in the sky and beautiful blue water.... who could ask for more. A very sporty little girl and her little brother with gorgeous curls, freckles and dark lashes! As you can see we enjoyed lots of fun on the sand and along the baths, which all finished with a swim..... I love my job! I spend Father's Day capturing the joy of little Matthew's baptism at St Peter's Anglican Church Cremorne. It was a beautiful day with Matthew's family and friends celebrating this great occasion. The christening took place at the baptisimal font at the side of the church, a very intimate location where everyone felt they were part of the occasion. Then following the ceremony everyone went back to the family home in Cremorne for an very relaxed fun afternoon. Matthew particularly enjoyed being handed around all the guests, such a smiley, happy, content little boy you would never guess he is only 4 months old! Little Miss Charlotte is just adorable at 14 days old! We absolutely adore photographing our clients families as they grow, and were really excited when this family contacted us to ask us to photograph their family again now their second son is around the same age as their first was when we last photographed them. Especially as Hugo's little brother Edison is just as smiley as he is! We met the at their family home in Camperdown, which is always a good option with 1 - 2 year olds as it's an environment they feel confortable in, then headed to the local park for some fun on the swings. Little baby Zoe is the luckiest girl being born into such a loving family with 3 older siblings already! We photographed her youngest brother Lachie a couple of years ago at about the same age and tried to get some similar photos to join the canvas collection on the wall of all the children. She is 9 weeks old, but as she was 4 weeks premi we weren't sure if we would get the same response from her, but given that she is technically 5 weeks old she is very aware and responsive..... maybe when you have all those older 'adoring' siblings you can't help but be alert. Little baby Oscar was 1 week old when I got to meet him with his very proud Mum, Dad and big brother William at their family home. At this age, he should have still been sleepy and dreaming only of milk and cuddles, content to let the world move around him..... but whether it was the education in the womb by his big brother, who is non-stop activity, or just wanting to get to know the world quicker, Oscar spent the morning keeping an eye on this strange lady and her camera, plus keeping one ear open to hear what his brother was up to! He is so adorable, with his 'old man' wrinkles in his forehead and brow, and very alert eyes it was hard not to just enjoy the attention. However, we all worked hard to get him to relax and sleep, even William and myself heading off for a play in his bedroom and jumping on his bed (a forbidden activity made it all the more fun!). Finally Oscar decided he would just give in and sleep for the lovely lady here to take his photograph. What do you do when there is lots of rain on a family portrait session.... embrass it and jump in the puddles! We photograph Peter & Callum every 6 months or so for family portraits they send home to family in England, this time they were camping down at Narrabeen Lakes, and as always happens when people plan on camping it rained! So we embrassed it and went to Jamieson Park on the more protected side of the lake (out of the rain) and dressed in waterproofs and gum boots to jump in the puddles...... lots of fun. Family Portrait Photography at Centennial Park Sydney - Daria & Michael's Extended Family Fun in the puddles! I got a call a couple of days before this family portrait session from Daria whose parents were out visiting from Russia and they wanted to capture some extended family portraits before they departed. Daria and family also live in the country but were in Sydney for the weekend with her parents, so we chose Centennial Park near where Daria & Michael used to live..... plus with the rainy weather it was the perfect location for a 3 and 1.5 year old boy to run around in the puddles and have fun! Such a gorgeous family, and so lovely to meet them and capture some memories for them. Hopefully we'll met again when their number 3 is born! This extended family portrait session was based around their family Christmas lunch, a perfect time with everyone together. It was lots of fun with the kids opening some presents, Nanna in the kitchen trying to cook the Christmas lunch and groups of people everywhere, set to a backdrop of Sydney Harbour on an amazing summers day it was beautiful. Christmas is a great time of year for families who get together and we enjoy being asked to capture the memories for our clients in extended or multi generation family portrait sessions. For this family the extended grandparents and aunts had flown into Sydney from Europe, Queensland and Perth at various times so we had a couple of portrait sessions to photograph the different elements. We photographed Chloe & Archie's parents wedding a couple of years ago and were delighted when they called up to get us to capture this next step in their lives...... Twins! Little Phoebe is just 12 weeks old but what a character with beautiful big blue eyes and the most adorable chubby cheeks. Peter is one of our regular clients inviting us to capture his memories of his family, including the family dog Onyx, every 6 months. It's fabulous for us to catch up with them and watch his son Callum grow, and also special records for Peter's family in England who don't get to see them all the time. Well this is the last of our lovely Mother's Day Mini Sessions, before we get into full swing of the wedding season again. The fabulous Corcoran Family we got to know last year as the girls were bridesmaid and flower girls for their sister / aunts wedding. We had so much fun with them on that day they've been keen to set up a portrait session ever since, so when our Mother's Day Mini sessions were announced they booked straight away. So here we are on location at Tamborine Bay Reserve Riverview, Lane Cove. It's a lovely quiet spot on the harbour with lush vegetation and even great trees to climb and jump out of which were a real hit! I took a little impromtu photo shoot with our girls last Friday. After we sent out of Mother's Day Mini Session offer we heard straight back from Viv & Cam wanting to book one in..... it was so lovely to hear from them as we had captured their wedding a year and a half ago. Viv was pregnant at the time with their little girl Isabella and we hadn't had an opportunity to meet her yet as they had moved away with work. But they have how returned to Sydney and wanted a family portrait session with both Bella's grandmothers as a special Mother's Day present. The mini sessions are slightly shorter with less photographs than a normal sessions, but an hour was plenty of time to capture little Bella's personality with her loving family, plus the other mother and child relationships in the family. Thank you once again guys it was so lovely to catch up, and I look forward to capturing more memories for you as your family grows! Peter is from England and has arranged family portrait sessions with us each 6 months to send photos home to family and friends so they can see his family grow, it's such a lovely idea. And for every family portrait photography session the family dog, a black labrador named "Onyx", is included as he is very much a part of the family! This portrait session was photographed at Clifton Gardens Mosman as its a great location with park, rocks, beach and pier. Plus Onyx could be off the lead and run around having fun on the beach with everyone else. The family portrait session was approached in a very relaxed way with everyone just playing around and having fun together, which produces these natural fun photographs. I hope you enjoy Peter, and we are looking forward to photographing the next stage in September! Once again we got to appreciate the joy of one of the couples whose wedding we photographed contacting us and asking us to capture their memories of the next exciting even in their life.... their newborn son. Congratulations Rachel & Rupert! At 12 days old Bertram was a little older than we usually like for newborns as they become more difficult to settle and be relaxed in front of someone new.... but this was no problem at all for this little baby he was perfect. It could have been because his parents were so relaxed too, and we just worked patiently with him. The only thing he really liked to do to photo bomb was stick his tongue out all the time! You'll see at the end he clearly is going to be doing this to his parents for a long time to come! As with most of our baby portrait session we photographed in the family home where the baby is most comfortable, and we have lots of options for changing clothes and including family items. For this portrait session we had lots to work with, firstly the antique wicker baby bassinet which used to be baby William's grandfathers, contrasting with the lovely lush garden it was gorgeous. Then lots of hand made items from his very talented aunts and grandmothers, even a croched rug which his mother had played with as a baby herself. This little bubba is a very lucky girl being the first of the next generation for both sides of her family. This baby portrait session included her crazy parents, grandparents on both sides and her aunts from both sides..... all a great laugh! The 3 sisters were all flying into Sydney for Christmas together with their families and they so wanted to capture the memories in photographs. Having our siblings scattered across the globe ourselves we totally understood the need to photograph this special time so we agreed to take time out of our Christmas leave to meet them at Clifton Gardens Mosman on Christmas eve. This family contacted us as they had seen our family portrait photography on friends walls and loved our work. So we arraned to meet them in a local park with their 1 year old and 3 year old daughters. It was so lovely to finally meet baby Jasmine, I felt like I already knew her as we'd photographed her parents wedding earlier this year when her Mum was 3 months pregnant. On a very hot day we thought it might be difficult to get a smily baby but Jasmine didn't disappoint. Isn't she gorgeous.... We have photos of this little baby girls curiousity, fun, and even that face they pull when doing a poo and Mum & Dad laughing! You'll see it's just before Christmas as we have a little Merry Christmas collage, and her Dad is also a big Guns 'n Roses fan, they entered their wedding reception to 'Paradise City', so he insisted on a photo of her in a band jump suit. This baby portrait photography session was one of those fluke occasions. This little babies Mummy called me as she'd been refered to us by a friend who had had some family portraits taken by us a little while ago. We arranged the portrait session for her little boy when he would be 12 weeks old, with his older brother and sister at their family home. After some communication on email we realised that we actually already knew each other from when we were kids.... but didn't recognise each others married names! So needless to say it was lovely to capture this family portrait, and their family home has amazing natural light as you can see which made our job even easier. Little man Lachie is very cute and has a gorgeous older sister and brother too. Thanks for contacting us Susannah! Old friends are the best fun to photograph.... and Michelle & Greg with their girls was no exception! We had a fabulous time laughing and playing down at Chinaman's Beach last Sunday. Greg and his girls as they are called are such a loving family, with the 2 older girls taking care of their half sisters most of the time they all have a great time. Thanks guys for asking us to capture some family portraits for you in time for Christmas! I'm so excited to finally be able to blog this fabulous extended family portrait photographs, it's been a while since we actually took the photos..... you see the session was set up by the 4 children and family, for their Mother / Grandmother's 70th birthday present so we had to wait until it was given to her before posting the photos.... just in case she saw them! So here it is, the 4 families with 8 adults and 8 children having lots of fun together down at Clifton Garden Mosman. The location was chosen at they grew up just up the hill from this beach and spent a lot of time their, plus it works really well for the whole group, even being wheelchair accessible. We love photographing families at this special time when a new baby has entered their lives. What a fabulous fun, family portrait photography session with the family dog, a black labrador, down at Chinamans Beach Mosman. The family contacted us because they specifically wanted to have family portrait photographs including their dog as he is their little boys "big brother", and not all photographer will work with pets. We really enjoying photographing the whole family and how they interact together so adding the family pets into the photos it just great. As you can see it was a beautiful Sydney spring day to be down on the beach and everyone had a lovely time. Now they will have these great photos ready to get prints and presents made for family and friend across the world for Christmas! So here she is our little cherub at 7 days old and a little bit later with her older sisters. Newborn baby portrait photography captured in the family home. A gorgeous sunny winters day at Chinaman's Beach, Mosman with a fabulous family and their dog Minnie for some fun family portrait photography..... we love our job! The family were enjoying rare time together... a blended family their daughter is out visiting her Dad from London for a couple of weeks.... so they've taken the opportunity to capture some of these memories with a family portrait. And I'm sure these photos will be cherished. Thanks for inviting us to photograph your family. There is no better place in Sydney to be for a family portrait photography session than Balmoral Beach Mosman, on a beautiful sunny Sunday morning.... And even better when it's an extended family, with multi generations from Grand Parents to Grandchildren with family from overseas. We had so much fun with all of this family playing on the rocks, to running along the beach, and slipping over on the rocks. Thank you G family for a lovely morning, and for letting us capture these memories of you time together as an extended family! What a gorgeous little family we had the pleasure of spending the afternoon with last Sunday. They were given a family portrait photography gift voucher by Hugo's grandmother, the same gift she had given his little cousin Dante who we photographed last year. It's so lovely meeting more of the family. We met the 3 of them at their home in Annandale and had fun being silly to make Hugo laugh, then we headed down to Blackwattle Bay and Bicentennial Park for some outdoor family portraits in the late afternoon sun. This little family is about to head off on a big adventure, moving to Seattle, so they wanted to capture the essence of their family in their setting in Sydney. So we started at their little Federation cottage in Balmain, and then went down to the end of Darling St for the view from Balmain East with some Sydney Sandstone, harbour ferries, the city and the Sydney Harbour Bridge to remind them of their home when they look back on these photographs and their memories from their new home in Seattle. Little Lucy doesn't really know what excitment is waiting for her, but she is more than happy to just enjoy every moment with her parents right now. Such a cheeky monkey at 9 months old, she was a joy to photograph. Thanks for inviting me to capture your memories of Sydney and your family, and best of luck with the big move! There is nothing more exciting for us than being asked by old friends to photograph their family, especially when they have a gorgeous little baby girl with stunning big blue eyes! I spent a lovely morning with this little family at their home, capturing Georgia at 9 months old one of the best ages we believe. She is a little bit cheeky, and was also teething so a little dribbly and grumpy at times but in the comfort of her own home she enjoyed having her photo taken. And I enjoyed photographing all those wonderful expressions, and those big blue eyes! Could little Madeleine's smile be any bigger???? This little 9 month old stole our hearts as soon as we met her, she has the most amazing smile and is entranced by everything. I fell in love with her even more as I worked on editing these photos as he smile is so infectious! As we do with most babies we started at their family home, where she was most comfortable and we were an exciting distraction. Here we got some lovely family portraits with her parents. And then went outdoors to a park in Balmain with more distractions and fun. Also her grandparents and the family dog joined in for some photos at the end of the session. I'm sure you'll be smiling right back at Madeleine as you look through these photos! This family contacted us because they wanted to have some photos of the 5 of them which very rarely happens. You know what it's like when the children get older and their lives become so busy and separate...... It's the perfect time to take the photographs to "Capture the Memories". Justin met them at Centennial Park near the Lily Pond and Paperbark Grove, such a lovely setting and allowing for the group to climb trees, wander over the picturesque bridge and through the trees. A beautiful afternoon enjoyed by all. Lucky little Eve has a very creative Mum who designed and presented this Farm Themed 1st Birthday Party for her. The table was set with pumpkins, corn husks, wooden baskets, sweet treats, crunchy apples, a strawberry patch, chick feed (chips), hot food and lots of cakes and sweets. Then the garden was filled with hay bails and nursery animals from KindiFarm. All the children had a fabulous morning petting the animals, cuddling them, feeding the bigger ones and even giving bottles of milk to the lambs and calves, which I'm sure they'll talk about for a while. Then they all got to share in the yummy 1st Birthday Cake set with all the different animal and made by Eve's Mum. I always get a little buzz when friends call and ask me to photograph their families, but never more so when it's for a newborn portrait session. It's such a special time in the families lives, especially with older siblings, to capture these emotions and the precious little new life is a real priviledge. 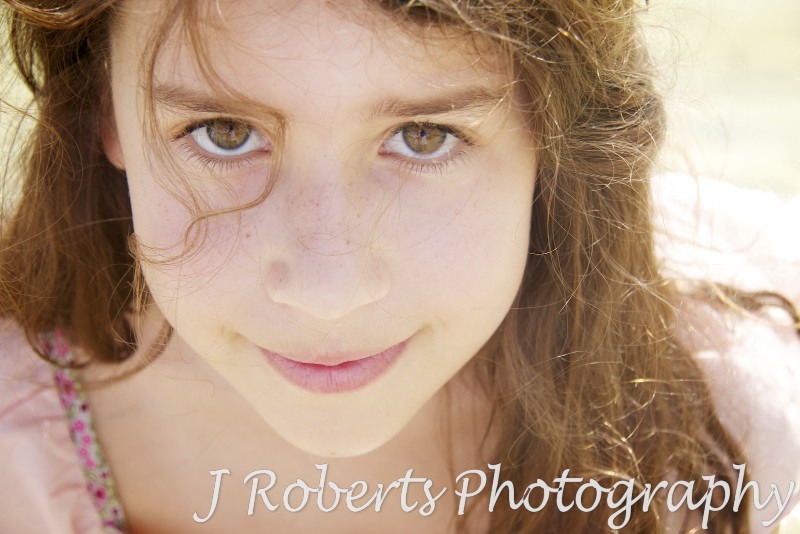 So can you can imagine I was overjoyed when my girlfriend called me to ask me to photograph their second daughter. Delilah at 12 days old is a little bit older than we generally photograph for newborns (aiming for younger than 10 days) but we were very patient and waited for her to fall into a sound sleep.... while enjoying a cuppa and also having some time photographing her big sister Adelaide who is just beautiful. Then she was ready to be photographed in snuggly newborn poses. I might be biased but aren't they just adorable! So we met at Centennial Park last Saturday, we knew we would be tempting fate arranging an outdoor shoot on the Easter weekend, but the rain held off and the only thing we had to contend with weather wise was a bit of wind. The shoot had to be outdoors as Ryan is in the army and I can imagine with all his energy he would feel very contained indoors. We had lots and lots of fun mucking around being silly, as this seems to be the as a couple, as well as some fun with Ryan's parents, and brother's family. We just love love love taking photographs of our wedding couples a few years down the track when they now have a little family, so we were really excited when Steve contact us and said he'd like to book a family portrait session for Sally for her birthday. The chosen location was Balmoral as this is where they were married in 2009, and the location has so much meaning to them, plus the photographs we took at their wedding were so lovely. And little Charlotte enjoys the beach so much, as most 18 month olds do! Grandma also came along to help with the entertainment and we managed to capture just a few shots with her too. This family have been talking to us for a while about getting some family portraits taken, however times were always very busy and they never managed to make the appointment. However, Sarah contacted us in Feburary and said that she had read an article we'd posted a while ago with a letter a mother had written to a photographer to thank them for "Capturing their memories" as a family, as she had been diagnosed with cancer. It's a sad message but you never know what is around the corner so take the opportunity while you can to photograph your family. This family enjoyed the Australia Day long weekend with a trip to Sydney from Melbourne. Knowing they had the trip planned David arrange a family portrait photography session with us for his wife for Christmas. Their little 18 month old Tyler just loves the beach that was the setting they chose... and he loved it! Both the girls were very cheeky and lots of fun. Thanks for letting us capture some of the essence of your family. This is a very cute little man! I was invited to their home to capture photographs of little Will for Christmas presents. He was such a delight, but being a typical boy he as most excited when he was naked, I particularly like the juxtapostion of the worn leather couch with this freshly minted naked little baby... his Daddy was concerned that he might wee but the good man kept it for later. We always feel priviledge to capture family memories for our clients, but this particular extended family portrait session was extra special as it was for one of my oldest friends and her little man William. Isn't he just divine, so cheeky and so much energy. The location for the family portraits was down at The Spit Reserve in Mosman as his Mum was keen to have the boats and a play area. The sun came out for a fabulous day and the colours are just so striking. Plus with William's big blue eyes it worked perfectly. We met the family including grand parents, and his little monkey "Jelly" in the mid morning and just played together from there! 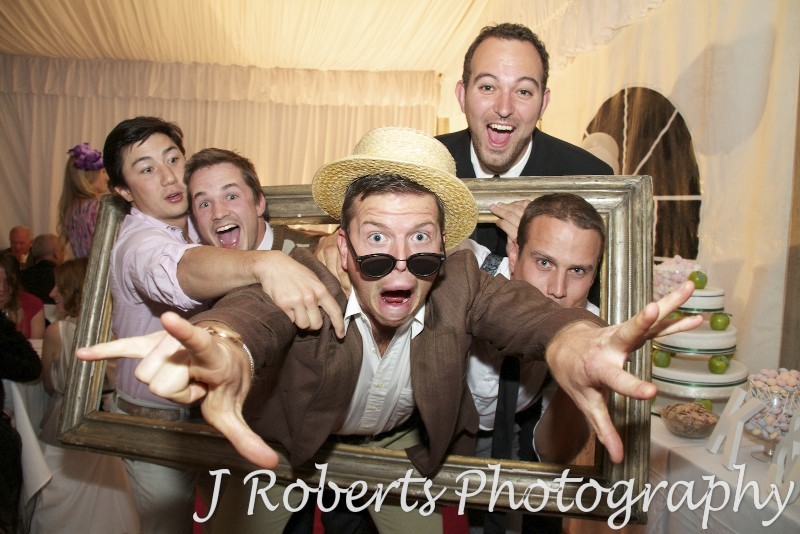 I had such enjoyment editing the photos just looking at this families fun and love.... I hope you enjoy looking at them too. What a great 1st Birthday Party this was for Alina! Held on sprawling grounds of a farm in Llandilo, Karina organised a grand celebration for Alina and her family and friends. Sunshine, guests, pony rides, bubble machines, ball pits, music, BBQ, loads of delicious food, and a dog in a waistcoat! This was a recipe for fun! The party kicked off with music, BBQ and plenty of freedom to play and chat for all, in temperatures reaching 30 degrees. Lunch was soon served and everyone was keen to get a taste of the delicious spread provided. The Birthday girl was keen to get in on the action and was seen to be leading the charge on playing in the ball pit. Then the resident pony was brought out and the children waited anxiously for their turn to ride around the paddock. A rendition of "Happy Birthday" was followed by the cake cutting - and what a tremendous cake! Then the kids' turn to 'Smash the Cake' (another cake!) Always a great way for the kids to 'have their cake and eat it' in the only way toddlers know how - using hands, feet, heads and anything else they need to eat it! What an exhausting afternoon - some are keen for a quick nap before coming back to the party later! I just love this little girls smile, it's more than a smile it is a full on laugh.... so cute to have these kind of expressions at such a young age! And what a lucky little cherub to have such loving parents. What a wonderful day for Kira and her 3 brothers to arrange for a photoshoot with the awesome backdrop of Sydney Harbour! 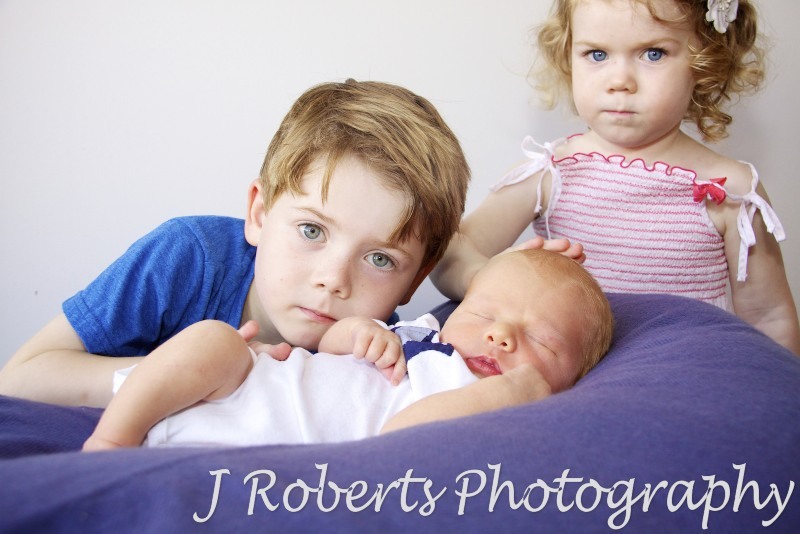 Kira had contacted J Roberts Photography to take casual and candid professional photographs of the 4 siblings at Blues Point in North Sydney. We used the stunning views of the Sydney Harbour Bridge and the Opera House in the background. This photography shoot was taken for a surprise birthday present for their mother - some enlarged art prints, canvases, acrylic blocks are going to be produced for their mother's birthday present. The shoot was filled with fun and laughter, and the wind made for some fabulous shots. When brothers and sisters get together for a fun photoshoot, the images taken are always full of giggles, laughs, tickling and fabulously fun photos. A lifetime of memories captured in one moment! Here we are at the final chapter of Greta's first year... she's grown into such an adorable little girl, with a very cheeky grin. Follow the story with our first two chapters 3 months old and 6 months old. Now I get the pleasure of putting together a coffee table book with the story of Greta's first year in photographs, and a commentary from her parents... can't wait! What a treat! One of my closest friends had her second little angel last week and I was on their door step almost as soon as they got home to take some newborn baby photos. And isn't he adorable.... It is so lovely to be able to capture these precious memories for my clients, but even more so when it's a close friend. Plus I got lots more cuddles too! This was a fun extended family portrait shoot with a focus on little 6 month old Lauren. She is just adorable and so cute when she smiles and wrinkles up her little nose. She was joined by her older brother, at 3 1/2 it's a difficult age to hold their engagement on the shoot but working as a team we generally get some good reaction, and as you can see a rumble with Dad never goes astray! Plus along with Mum & Dad, they were also having a visit from their New Zealand Grandparents. Beautiful memories of a fabulous time for the whole extended family. The gorgeous little Zoe gave her Mum, and both Grandmother's an extended family portrait photography package for their combined Mother's Day presents. What a treat, we got to work with the whole family. Little Oliver tried to be shy to start with, but it didn't last long, then his cheeky little personality came out. Isn't he adorable with those white blonde curls plus the winter beanie and the fabulous grin. What a lovely family portrait they make. What a lovely extended family! Three siblings who have all individually at different times migrated to Australia from South Africa (via some other destinations), settled into the Australian way of life while their family has grown. However, they are still trying to convince their Mum to move out here, so took the opportunity to have some extended family photographs taken while she was visiting from South Africa. We suggested the stunning Blues Point on a Sunday morning so she will always have sparkling Sydney to look at when she looks at photos of her family together. We had a great morning as you can see, everyone of the family has bubbly personalities and we could have chatted and laughed all morning... well we did.... plus we took these great photos! The Grandmother of this gorgeous little boy contacted us a couple of weeks ago to arrange some family portraits for her Son and Daughter-in-law, it's such a lovely gift. Now I'm sure she will be getting some beautiful photos in return for her Mother's Day present! This family have been blessed with newborn baby twin boys, and they have a gorgeous older sister. They also have some lovely friends who purchased a newborn portrait photography gift voucher from us and gave it to them as a gift after the birth. It's such a precious gift to give a family, captured memories to treasure. As you know I just love taking newborn baby portraits, the floppy, softness of the little babies in their first week is so precious to capture in photographs. But last week I was in for a real treat with these gorgeous little twins. The girls were 2 weeks old which is usually outside my newborn window for portraits however as they were slightly premature they were still a little sleepy. As you can see one is slightly larger than the other and was more alert, but when snuggled up together they were very happy to settle and sleep. Their older sister was also very excited about her two little sisters, and protective as all sibling are, the most amazing time for any family..... This family now has these beautiful memories captured to treasure for a lifetime. This family have a lovely tradition of have a portrait session with their children at ages 3 month, 6 months and then 12 months to create a beautiful coffee table book of their first year with professional portrait photographs. We were referred by their previous photographer when she closed her business, and have been priviledged to capture this story for their third daughter Greta. Which means we get the bonus of also working with their older 2 girls. As you can see they are a beautiful family, and we have a great time interacting with them. Stay tuned for the final chapter with the 12 month old portraits later this year! Aren't these guys adorable... "Copy" & "Paste"..... well it's true with the twin boys they really are a matching set! We've been photographing this family for a number of years now but this is our first chance to capture their new additions Austin & Lewis. They are 6 months old, but being premature twins their adjusted age is 3 months old, and aren't they just cute. We had a great morning at the family home photographing them with their parents and older brother. Capturing some family portraits for them to remember this time for years to come. Me thinks there is going to be lots of rumbles and rugby in the backyard as they grow up! We were invited to capture some fabulous memories of John's 60th celebrations, at Cucinetta Ristorante, by his 4 gorgeous daughters. They had planned a beautiful lunch overlooking the harbour and it was a stunning day, if a little hot and humid. Justin was the photographer on the day and he really enjoyed mingling with the very friend crowd. We love these precious relationships, little man Max here was well known to us even before he was born, 18 months ago we photographed his parents wedding! So we were delighted when his Mum & Dad asked us to come and capture their memories of this precious time. Max is now 10 weeks old and a very cute baby, he wasn't really in the mood to smile but that just made for some fun shots of his Dad particularly trying to make him laugh..... I especially enjoyed working with the beautiful outdoor light, and the garden setting they had. Max's Dad won this little baby couch in a raffle just days before he was born and I couldn't resist using it as a prop. Well school holidays had only just started and this family decided to head down to the beach, and invited us along to capture the memories. Also in time for them to use the family portraits for Christmas presents.